This section is from the book "The House: Its Plan, Decoration And Care", by Isabel Bevier. Also available from Amazon: The House: Its Plan, Decoration And Care. Among nomadic tribes whose place of habitation is dependent upon the water supply and the pasture a movable dwelling is a necessity. A small amount of wood would serve as a frame work or support and skin for a covering, while its lightness and ease of transportation made the tent a most desirable dwelling. We read how Abraham sat at the door of his tent, and how the Israelites dwelt in booths at the time of one of their great festivals. "And ye shall take you on the first day the boughs of goodly trees, branches of palm trees and the boughs of thick trees and willows of the brook - ve shall dwell in booths seven days"*. 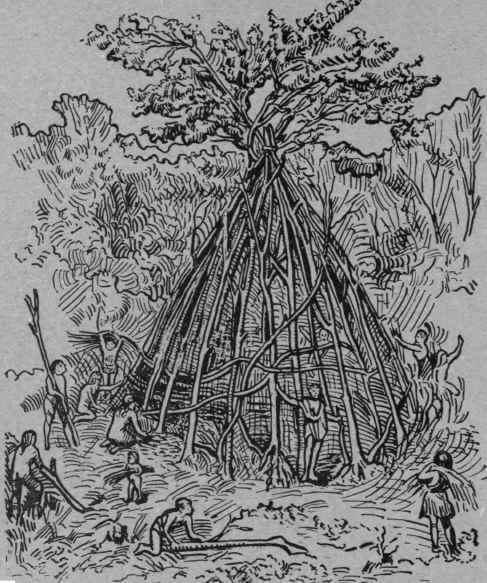 PRIMITIVE HUT MADE BY INTERTWINING OP BRANCHES. Light framework covered with Reeds or Woven Straw. One other form of dwelling which Nature has provided for her children was that of the cave in the rock from which it was sometimes necessary to drive out the lower animals before it could be used by man. The cave finds its modern counterpart in the "dugout" of the west. The sod house or "dugouts" are neither so durable nor desirable as the log cabin which has served as a dwelling place for so many pioneers. The log cabin seems to be the most universal form of early dwelling. Types of it are found among primitive and modern races, in Russia, and in all parts of the United States. 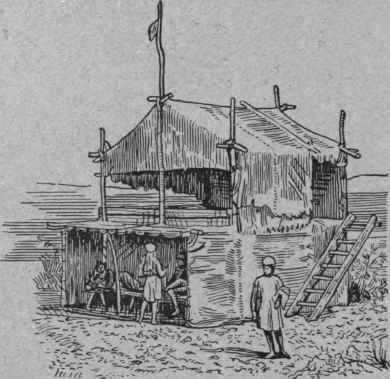 TWO-STORIED TENT COVERED WITH SKINS. Two other forms of human habitations are of interest particularly to Americans. First: The pueblos; this name signifies a market town or village and is applied to the structures found in Mexico. They consist of a compact mass of rooms that may be entered only from the top. They were entered by ladders and the ladders were drawn in after the people, so these dwellings offered considerable security to their occupants. These buildings were made of stone carefully laid and the crevices filled with clay and mud. They are both rectangular and circular in form. They contained from two to six stories with seventy or more rooms or cells on each story. Some of the rooms communicated with each other by trap doors, and some of them had openings in the side walls admitting light and air. 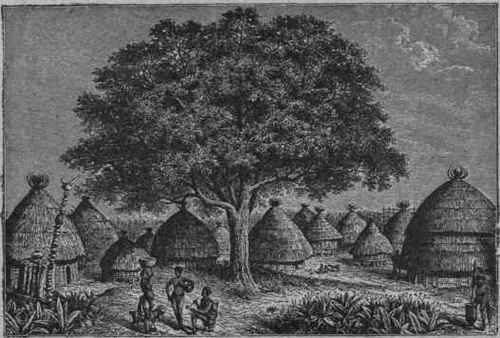 REED TENTS OF AFRICAN TRIBES. Mr. Lee Childe gives a description of a modern Indian pueblo which he visited in 1881. "Before us," he says, "on the right are two rows of these adobe habitations, low, with no openings outward, no doors, no staircases. The flat terraced roofs are reached by a movable outside ladder. All the windows and doors open into an inside court which can only be reached by going down another ladder. Each house is thus a little fort into which, the ladder once withdrawn, neither man nor beast can penetrate". 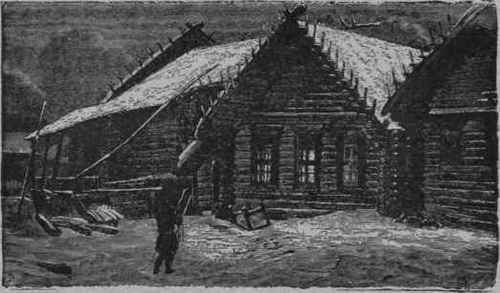 LOG HOUSES OF RUSSIAN PEASANTS.